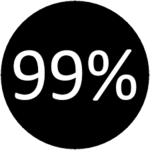 Bernie Sanders is the candidate of the 99 percent. An online MSNBC poll of 22,000 voters (so far) shows 91% think Bernie Sanders is more qualified to be President than Hillary Clinton. Link to poll. Bill Clinton Labor Sec Robert Reich: Bernie "absolutely correct" in Daily News, criticism "bonkers".